On the 29th and 30th of June, violent thunderstorms known as a “derecho” slammed a 700-mile-long corridor from Indiana to the southern mid-Atlantic coast. The storm resulted in extensive straight-line wind damage and millions of power outages, but also created a bonanza of free firewood in a part of the country more accustomed to treating firewood as waste than as a valuable, low-carbon fuel. In the Washington DC area tons of wood from fallen trees will be sent to local dumps, where haulers and tree trimmers pay $32-46 per ton to dispose of it. Firewood from the derecho can provide almost free, carbon neutral heat for thousands of homes, but here is the rub: there is barely enough time to split, stack and dry the wood before this coming winter arrives. Hopefully, many homeowners will be putting it away for the 2013/14 heating season, 18 months from now. Wet wood produces little heat, and excessive smoke, not to mention creosote. So if people are going to keep firewood from the storm, it needs to be split now, stacked and covered. Approximately 60% of stoves in the Washington area are not EPA certified. While these old stoves may be one person’s energy solution, they could also be their neighbors’ health hazard, especially if unseasoned wood is used. In New England, downed trees are far more likely to end up as firewood. And, county and city tree crews sometimes provide wood from storms to low-income residents who may have had to otherwise take public heating assistance. Many churches also have “firewood ministries” where the church parking lot becomes a drop off point for tree trimmers and the wood is distributed to needy families in the community. It is now a month after the derecho and there is still an abundance of not only downed trees, but also piles of firewood left in yards, ready for someone to ask if they can haul it away. The Alliance for Green Heat would like to see more jurisdictions deposit the wood in a yard and let anyone with an EPA certified stove come get it for free. Ten years from now, rising fossil fuel prices may make wood from such storms much more valuable, even to households with natural gas lines. For now, we suspect that a very, very small percentage of that wood will go to reducing fossil fuel heating in the DC area. In rural parts of Maryland, Virginia and West Virginia the storm produced a windfall for many homeowners and may create a much smaller demand for commercially sold firewood this fall. Do Electric Rates Impact Wood Heat? When the price of oil goes up, it goes up for everyone. But electricity rates vary widely by state with residents of some states paying double what they pay they other states. New York and Connecticut saddled with the highest electricity rates in the country, which may have contributed to the rapid rise of wood heating in those states. Conversely, in the south where electricity rates are the cheapest, the use of wood heat decreased in most states between 2000 and 2010. The economic disadvantages of fuel oil and propane as heating fuels are often discussed, but electricity is a more complex story. More than a third of American homes use electricity as the primary source of heat (US Census) and another 24% use it as a secondary heat source (EIA). Granted many of them are in the south, where the heating load is smaller but more northern states can have surprisingly high rates of electric heating. For example, 15% of homes in Connecticut, where electricity is second in price only to Hawaii, primarily use this form of heating (US Census). An electric boiler costs an estimated $35.05 per million Btu, according to EIA, and an electric space heater, a common appliance used for secondary heating, costs an estimated $34.32 per million Btu. An EPA certified wood stove running at 72% efficiency, in contrast, is estimated to cost only $12.63 per million Btu. These EIA calculations assume that electricity costs only 11 cents per kWh. However, half of the U.S. averages more than that amount. In northeastern states such as New York and Connecticut where electricity costs over 17 cents, the cost of using an electric heater can be as high as $56.42 per million Btu. This may make consumers think twice before buying an electrical space heater instead of a wood stove as a secondary space heater. 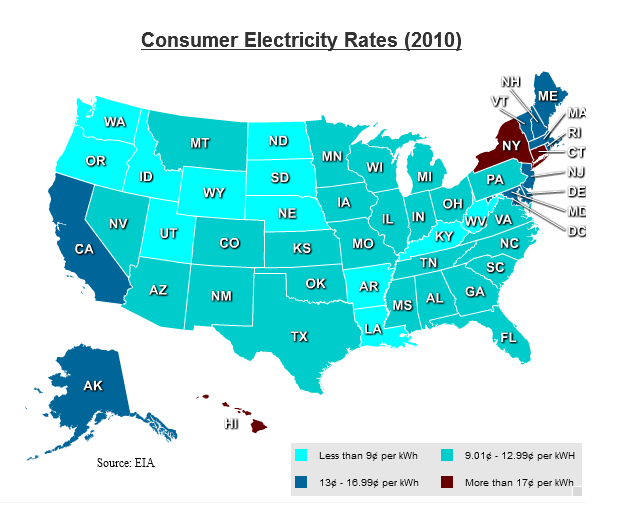 Map of average U.S. electricity prices by the Alliance for Green Heat. Click to enlarge. Consumer rates in Alaska, California, Maryland, New Jersey and Washington DC are on the high side, ranging from 14 - 17 cents per kWh (an average of $41 - $50 per Btu for electric heating). The majority of homeowners in the south, west and midwest pay 9 - 13 cents per kWh for their electricity, which works out to about $26 - $38 per Btu. That is a much cheaper rate than some states, but still twice the cost of heating with wood. Pacific northwestern states with a strong hydro-electric presence and Appalachian states with an abundance of coal typically average electricity costs below 9 cents per kWh. Idaho has the cheapest average electricity rate of any state at 7.99 cents per kWh, thanks to low demand and a large number of dams on the Snake River. Alliance for Green Heat, July 25, 2012 - The 25C tax credit for wood and pellet stoves and boilers that began at $1,500 in 2009, dropped to $300 in 2011, and then expired last January, may return. While nothing is expected to be passed in Congress before the election, a variety of bills could be passed soon after, during what is known as a “lame duck session”. One possibility is that Congress will simply extend the 2011 version of the bill, which would cap the tax credit for 75% efficient (LHV) biomass heaters at $300. There has been talk of implementing this retroactively, so that purchases made earlier this year would be eligible for the tax credit. Another option would be for legislators to create a standalone bill that could change the eligibility criteria and raise the credit up to $500 or even $1,000. Various organizations in the biomass space are pushing for an extension of 25C, including the Alliance for Green Heat, Hearth, Patio & Barbeque Association, the Pellet Fuels Institute and the Biomass Thermal Energy Council. For more background on the tax credit, see http://www.forgreenheat.org/incentives/federal.html, and for background on attempts to establish an alternative performance-based credit, see http://www.forgreenheat.org/incentives/homestarpage.html. The currently expired 25C tax credit was a cost-based credit, meaning it was based on what the consumer spent on their biomass heater – not the amount of energy saved. Many in the energy community, including the three big non-profit players in DC – the American Council for an Energy Efficient Economy, National Resources Defense Council and the Alliance to Save Energy – have been trying to craft and push a performance-based credit. This would involve having an energy auditor measure the expected energy savings and then basing the total credit on that. Under criteria for evaluating a tax credit design, both the performance-based and cost-based credits have advantages and disadvantages with neither design being unambiguously the better option based on current information. Both a cost-based and a performance-based credit are designed to reduce energy use and CO2 emissions by providing incentives for energy conservation investment. However, they differ in their relative effectiveness and costs. In general, a performance-based credit is more likely to effectively reduce energy use and CO2 emissions because it rewards energy savings from the investment rather than the cost-based credit’s rewarding of spending regardless of whether this spending results in energy savings. However, the performance-based credit may have significant up-front costs for energy audits, not required by the cost-based credit, which could reduce its effectiveness by discouraging investment. In addition, for taxpayers who do invest, these up-front costs may mean that a performance-based credit may have significantly higher taxpayer compliance and IRS administrative costs than a cost-based credit. A credit’s fairness depends on subjective judgments of how a credit varies with a taxpayer’s income level. In response to a court order, the EPA proposed updates to its national air quality standards for harmful fine particle pollution, known as PM 2.5. The EPA identified 6 counties to achieve the standards by 2020, including lincoln, County, MT, where Libby is located. The EPA's proposal would lower the standard from 15 micrograms per cubic meter to 12 to 13 micrograms per cubic meter. According to Curtis Noonan, a professor of epidemiology at the University of Montana who has studied the Libby change out extensively, "it may depend on if the number is set at 12 or 13, as Libby may currently fall. On an optimistic note, Professor Noonan said that he suspects, "the state DEQ would receive plenty of time to prepare a plan to meet the 202 target." This may involve more wood smoke curtailment measures. The EPA estimates that 99% of the U.S. counties will meet the proposed rules by the year 2020 without having to make radical changes or spend a lot of money, as a result of former anti-pollution efforts. However the six counties won't meet the new standards by 202 without additional anti-pollution efforts. These counties include Riverside and San Bernardino County in California, Santa Cruz in Arizona, Wayne County in Michigan, Jefferson County in Alabama, and Lincoln County in Montana. According to the Clean Air Act of 1970, the EPA must update its soot standards every five years, yet President Bush failed to enforce this update and President Obama's EPA wants more time to research these new findings and wait until after the November elections. However as a result of the lawsuit from the 6 States mentioned earlier, Obama's EPA was forced to sign a proposed rule on June 7th, 2012 however the deadline was extended to the 14th of June. The rules are to be finalized in December of 2012 after extensive scientific research. "We will be saving hundreds of thousands of lives," said Gina McCarthy, assistant administrator for EPA'S Office of Air and Radiation, and that is the most important thing the EPA can do today. After hearing many complaints from Montgomery County residents about the high concentration of wood smoke and watching the continued installation of old, polluting wood stoves in neighborhoods, the Alliance for Green Heat is working towards a ban on new installments of old stoves. The Alliance met with the County Department of Environmental Protection and also made a formal presentation to the Montgomery County Energy and Air Quality Advisory Committee (EAQAC). The Alliance also reached out to the Mid-Atlantic Hearth, Patio, & Barbeque Association (MAHPBA) who supports the project, the Maryland Lung Association and other groups. This initiative would not affect existing stoves, but would prevent uncertified or exempt wood stoves from being installed in the future. "It is important that major East Coast communities recognize wood smoke pollution is a residential problem, not one to lay at the feed of industry," said Rod Tinnemore, Wood Stove Coordinator at the Washington State Department of Ecology. "It is no longer acceptable to solve individual energy problems by creating community-wide health problems." Tinnemore said, referring to the impacts that are particularly likely in densely populated neighborhoods like many in Montgomery County. If you are interested in staying abreast of this initiative, or live in Maryland and want to be part of a stakeholder process, please contact Melissa@forgreenheat.org. The Alliance continues to press for energy auditors to include wood stoves in their audits. Discussions with EPA, NYSERDA, BPI, state officials and others point to a near unanimous agreement that wood stoves deserve better representation in energy audits. The Alliance approached two of the main institutions in the energy audit space, BPI (Building Professional Institute) and RESNET (Residential Energy Services Network) and began initial exploratory talks. We were also directed to the four companies who have accredited home energy software tools used by auditors. We contacted the representatives from these companies and found that none of the four include checklists for wood stove safety, which means home energy auditors who use this software most likely are not checking wood stoves. The good news is that most of these software designers are interested and willing to include information on wood stoves in future editions of their audit software. Andy Bardwell who represents the energy audit OptiMizer software said, “We'd like to include this type of safety checklist for wood stoves in future editions,” after looking over the wood stove energy audit checklist that the Alliance for Green Heat is developing. The Alliance urges professional auditors and software developers to take a look at our checklist here and give us with feedback on how wood stoves can be better included in home energy audits. 2014 Update: BPI adopted voluntary standards for BPI accredited energy auditor to inspect wood and pellet stoves and make recommendations to homeowners. However, because they are voluntary, as of 2017 it appears that they have not been used much. To get these standards used by energy auditors, state may have to make them part of the mandatory energy audit. We expect states like New York, Vermont, New Hampshire and Maine could benefit from this. Please contact us if you are interested in helping to get these standards used more.